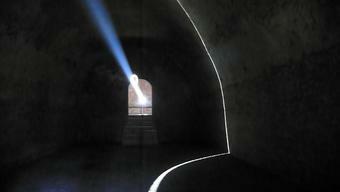 Sunpath for San Basilio is a site-specific sun machine that penetrates the dark interior of a cellar of the Castello di San Basilio with a ray of concentrated sunlight. 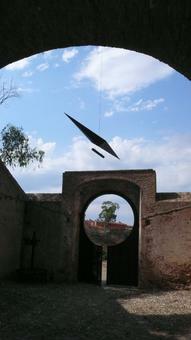 The artwork constitutes not only the physical installation but also the journey across the grounds of the castle and former monastery in Basilicata, Italy, from the bright light of the garden into the subterranean vault. 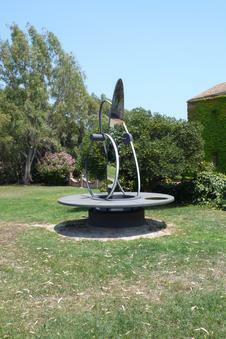 Visitors first catch sight of a kinetic sculpture on a raised, round platform made of volcanic rock. 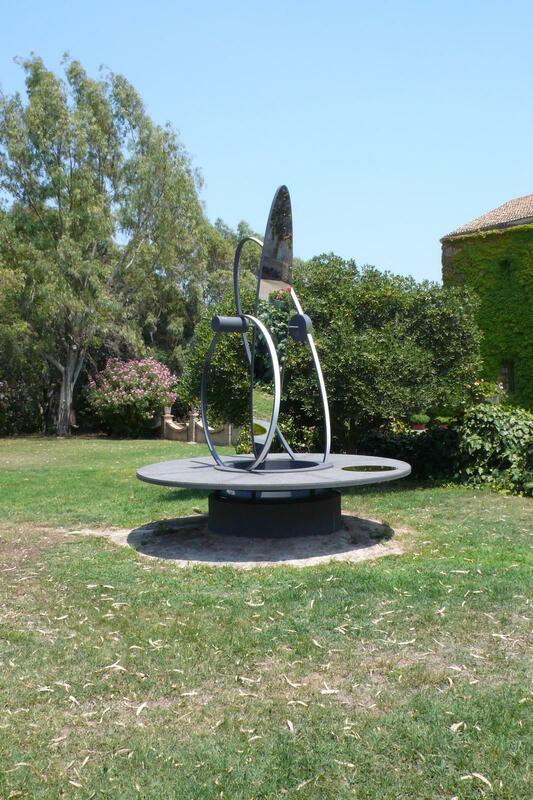 In fact, the sculpture is a sun-tracking device positioned on top of an opening that admits light into an underground chamber beneath the platform. 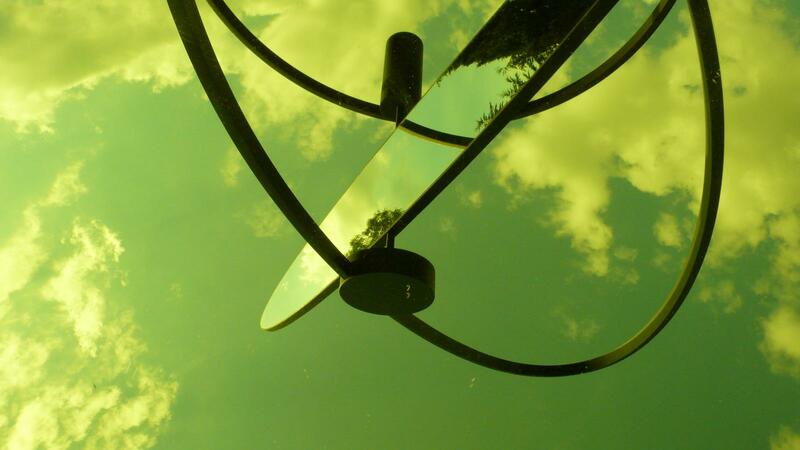 The elliptical mirror on two swivelling axes pivots horizontally to follow the path of the sun across the sky each day and adjusts vertically to trace the sun over the course of the year. From the garden, visitors descend a path to a walled enclosure. A large circular cut-out at the top of the iron gate affords a glimpse into the enclosure, where a compass hangs above the cellar entrance. Entering the cellar, viewers find themselves in a long hall with a barrel-vault ceiling and a floor covered in triangular, anthracite clay tiles. Faint daylight streams in through a purple-tinted oculus above the door behind them and through another doorway at the far end of the room. 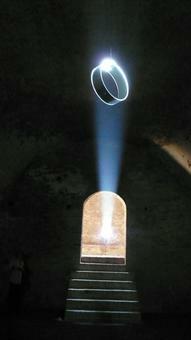 On sunny days, viewers are rewarded with a dramatic, meditative light show: a vertical line of sunlight, produced by a rotating mirrored ring suspended from the ceiling, slowly travels the surrounding space, scanning the walls, ceiling, and floor. A full revolution takes approximately two minutes. The source of the light is the sun-tracking device in the garden above. 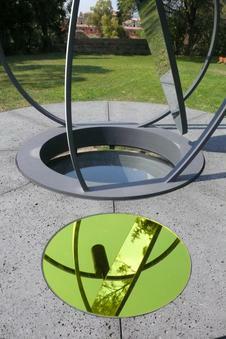 It casts a ray of sun down into the domed chamber, where an angled mirror redirects the beam into the main installation space and onto the rotating ring.